Rivers Edge Hotel and Spa is an environmentally friendly 100 room deluxe boutique hotel and a vital component of Portlands South Waterfront District. Perched on the banks of the Willamette River just minutes from downtown Portland Rivers Edge offers travelers the sophistication and warm hospitality of the Pacific Northwest. Guests and visitors enjoy classic service modern amenities and comforts expected from Portland boutique hotels making Rivers Edge Hotel and Spa a favorite among all Portland waterfront hotels. Among the hotels valued amenities is The Spa at Rivers Edge a luxurious two level 13000 square foot full service spa salon and fitness center. 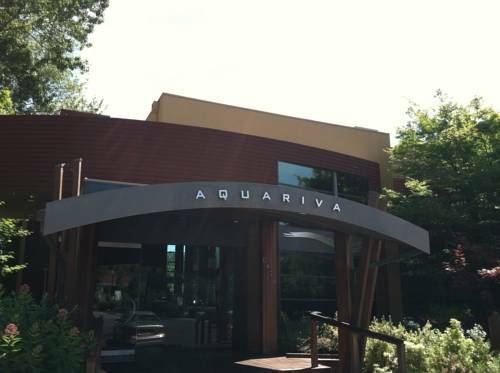 To delight the palate at Aquariva restaurant and bar the dramatic contemporary riverside dining space featuring outdoor seating at rivers edge. Rivers Edge event space lends itself to productive meetings intimate private parties or equally incredible riverside wedding events. From 10 to120. Overlooking the Willamette River is an outdoor terrace perfect for al fresco coffee breaks receptions and parties. And the best to see and do downtown is within a quick and easy Portland Streetcar ride. Perched on the banks of the Willamette River just minutes from downtown Portland - Waterfront District - trendy NW 23rd Street and the Rose Quarter The Rivers Edge Hotel and Spa is a vital component of Portlands South Waterfront District. This emerging mixed use neighborhood integrates alternative transportation parks trails green building practices retail arts and restaurants.